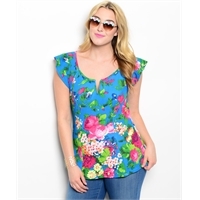 This fun floral top features a short flutter sleeve and a subtle V-neckine. Made in the USA of 95% polyester, 5% spandex. Runs small. 1X bust 38", 2X Bust 40", 3X bust 42"